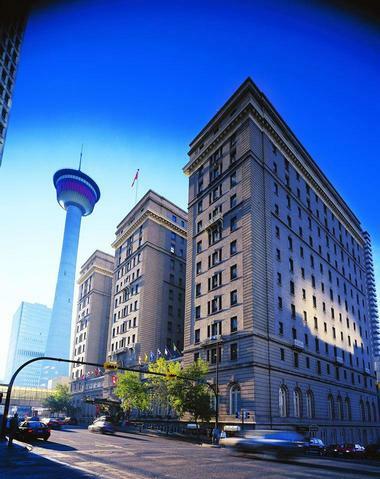 The Fairmont Palliser is an historic hotel in downtown Calgary. Built in 1914, it originally served as an overnight stop for travelers on the newly-laid Canadian Pacific Railroad. Since that time, the Fairmont Palliser has welcomed heads of state, celebrities, and royalty, including Queen Elizabeth II. Close to the financial and business sector of Calgary, the hotel is also convenient to shopping, arts, and entertainment venues. The original hotel has been renovated twice, but has kept its grandeur. 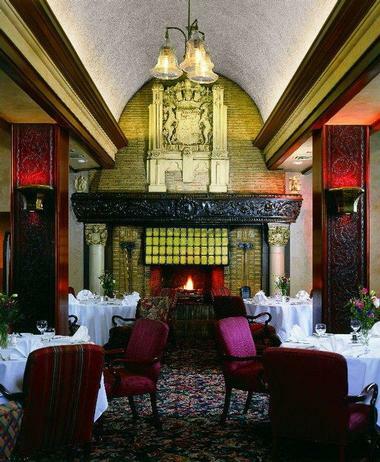 Marble floors and pillars in the lobby welcome guests, and the huge fireplaces in the hotel's dining room still burn and are a Calgary tradition. 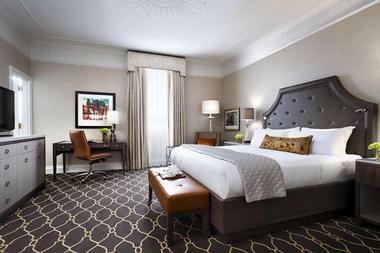 All of the rooms at the Fairmont Palliser Calgary are elegantly designed and expertly outfitted. Each room is air-conditioned, provides lush bathrobes for guests, have a coffee maker, cable TV on flat-screen televisions, down duvets on plush beds, an iron and ironing board, a mini-bar, hair dryer, cordless phones, a desk and chair, and high-speed internet access. Fairmont Rooms are 225 square feet, well-appointed, and stylish, and offer the choice of a King bed, a Queen bed, or two Doubles. Deluxe Rooms are laid out like the Fairmont Rooms, but larger, at 275 square feet. Signature Rooms, at 325 square feet, are large enough to allow separate sleeping and sitting areas. Junior Suites are 400 square feet, sophisticated and spacious. The sitting area has either a sofa or armchairs. One Bedroom Suites, 450 square feet, have a large seating area with wide windows, and a separate bedroom. The Palliser Suite is tasteful, with refined furnishings, a roomy parlour, and a residential feel. The Heritage Suite is grand and luxurious, and is reminiscent of the golden age of travel. Ornate architectural details add to the charm of this 900 square foot suite. The suite has a pantry area with a fridge and a microwave, a dining area, a spacious foyer, a lavishly-decorated fireplace, panoramic city views, and a guest bathroom. The master suite has a king bed and its own bathroom. The Heritage Suite can be configured to have two or three bedrooms. The Fairmont Gold Floor is on the penthouse level, and has private concierge service. A lounge reserved for gold members only serves barista-style coffee around the clock, and serves canapes in the early evening. Visitors to the lounge may sink into its comfortable chairs, and make use of the Fairmont's iPads and high-speed internet. Shoe shine and turndown service are offered to guests of the Gold Floor. All Fairmont Gold Rooms have upgraded amenities, including Keurig or Nespresso machines, an umbrella, humidifier, closet safe, plush towels and robes, a digital scale, and a Bose sound system. Gold level guests may request a crib, printer, sofa bed, or toaster. 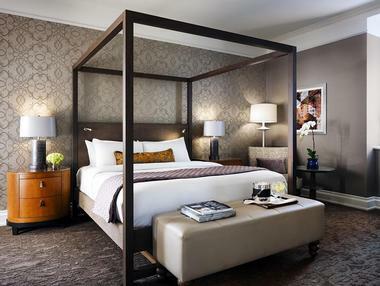 Fairmont Gold Rooms are 350 square feet, and have one king, one queen, or two queen beds. The rooms are equipped with a CD player/alarm clock, two telephones, and receive morning delivery of coffee, tea, or juice, and the guest's choice of newspaper. Fairmont Gold Large Rooms have the same amenities and service, but in a more spacious 400 square foot room. Fairmont Gold Suites each have a large bedroom with a king bed, a living room, and a dining room that seats four people. The Signature Suite is the most luxuriant guest room in the hotel. It has a large bedroom, a living room, 1.5 bathrooms, a kitchenette, and a regal dining room that seats eight. The Royal Suite welcome Queen Elizabeth II on her 1990 visit to Calgary. It has a king bed, two large bathrooms and a living room, and an ornate dining room that seats six. The Rimrock Room takes its inspiration from the early years of the hotel, and has a 1920s Prohibition theme. Serving luxury cuisine, it is open for breakfast daily, and for dinner on Thursday, Friday, and Saturday evenings. The Rimrock Room is also open for Sunday Brunch and for Afternoon Tea. The restaurant Diners will eat surrounded by Prohibition-themed décor, hand-tooled leather pillars, with a huge fireplace blazing in the background, and while listening to live big band swing and jazz music. Breakfast at The Rimrock Room gives diners the choice of a full buffet, a continental buffet, or ordering a la carte. Diners can start their day with egg dishes, bacon and sausage, fried mushrooms and tomatoes, short ribs, baked goods, muesli, oatmeal, banana-bourbon French toast, and Belgian waffles. Dinner at The Rimrock Room starts with sublime appetizers: corn and shrimp soup, Dungeness crab cakes, Caesar salad topped with ricotta cheese, sea scallops, or sweet pea and mint tortellini. The menu of entrees is heavenly: beef tenderloin, Black Angus prime rib, duck, Cornish hen, organic salmon, shoulder of lamb, and mushroom risotto. For dessert there is vanilla crème brulee, bittersweet chocolate cake, cream puffs with hazelnut mousse, and a raspberry peach melba. The Rimrock Room's sophisticated Afternoon Tea is served daily, and features a selection of loose or bagged teas. Diners are offered dainty finger sandwiches, assorted berries topped with Grand Marnier cream, delicate pastries, and oven-fresh vanilla scones. 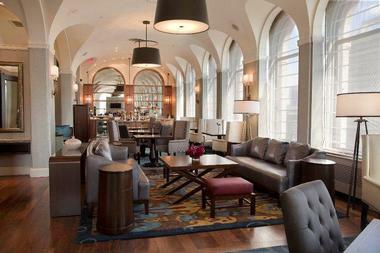 Other dining options at The Fairmont Palliser include The Oak Room Lounge, a fashionable bar serving cocktails and microbrews with an accompaniment of live jazz and contemporary music. There is a Starbucks in the hotel, and options for in-room dining 24 hours a day. 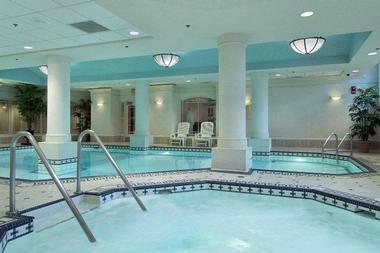 The Spa at the Fairmont Palliser Calgary offers the traditional services of massage, facials, and body treatments. It also has a nail bar, where customers may have their finger or toe nails shaped, their cuticles cared for, and polish applied. Callus removal and foot massages are also offered. The Fairmont Palliser has several signature facial treatments, including the ChronoReverser AHA Treatment, which removes the outer layer of skin, leaving the surface looking luminous and smooth. The Absolute Pearl treatment treats age spots and pigmentation. The Oh So Organic facial is deeply nourishing, and the Deluxe Anti-Aging facial renews the skin and decreases signs of aging. Signature body treatments at the Fairmont Palliser's spa include a Moroccan Oil Body Wrap, which is applied with warm stones, and is intensely hydrating; the Tranquil Moments Body Wrap, which offers a full-body dry exfoliation followed by a full-body massage with a scented oil designed to bring about calmness; and A Place of Peace treatment, which uses aromatherapy and warm stones to balance the body and mind's energy. The Fairmont Palliser has a fitness center that allows its guests to keep in shape while travelling on business or for pleasure. 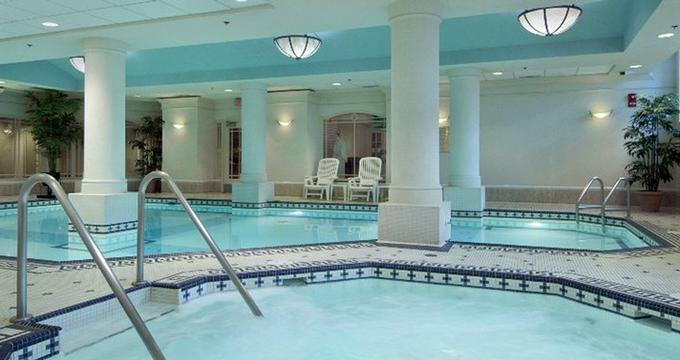 It has an indoor pool with poolside dining, a whirlpool, a large eucalyptus steam room, and a fitness center with weights and cardiovascular training equipment. There are men's and women's locker rooms available. During the summer months, guests might wish to join in the weekly BeeMW Bee Hive excursion. Guests may be chauffeured in the hotel's BMW or cycle on one of the hotel's BMW bikes, to the home of the hotel's four honeybee hives. Dressing in beekeeper attire, guests will observe the bees hard at work, and learn about bee sustainability and the process of honey making. The tour lasts one and a half hours, and is followed up with an hour and a half's tasting back at the hotel. Guests can sip honey lavender cocktails, drink honey-infused chardonnay, and dine on a selection of charcuterie and cheeses, accompanied by a honey and lemon cake. Intimate or grand, big or small, The Fairmont Palliser has the reputation of being the most sophisticated wedding venue in Calgary. Its flawless service and elegant rooms make it the first choice of couples in the Calgary area. All couples choosing The Fairmont Palliser for their wedding reception receive a complimentary wedding night stay in one of the hotel's Junior Suites. The hotel has wonderful photo locations, including the grand marble staircase. The hotel's wedding manager works with each couple to provide the best in dining, service, and preferences. Custom catering can be worked out with the chef; personalized menus are available, and the pastry chef can work with couples to design the wedding cake of their dreams. The rooms offered for weddings at The Fairmont Palliser are the last word in sophistication. The Crystal Ballroom, which seats 400 guests, has a gilded ceiling hung with fifteen crystal chandeliers, arched windows, and stately marble columns. The Canadian Pacific Pavilion seats 120 guests, and is stunning, with floor to ceiling windows and a forty-foot glass rotunda. The Alberta Ballroom, which seats 250 guests, has hand-painted murals on the wall, and The Turner Valley Room has cranberry-colored walls accented with jewel tones.